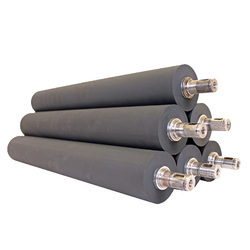 Our range of products include ebonite rubber rollers. Usage/Application Textile , Paper etc. Application Textile , Paper etc. We offer Ebonite Rubber Rollers to our clients. Anar Rub Tech is capable of manufacturing Ebonite Rubber Rollers. Our Ebonite Rollers can withstand high temperatures of steam and water. Ebonite Rollers are used in superior engineering and it function more smoothly in varied applications.